Material donated by former internees. Recollection and records of former Dunera Internees held atTatura including Lobert and Seefeld.|"Jewish Conspiracy" by Weinmann.|Telegram- Wagner, death in family.|"150th. Celebrations- Templers", speech by Beilharz|Frida Riboni's story.|Obituary Aberle.|Records Khuna. Presented to Mr.C Hogan to attend the opening of Parliament in the Exhibition Building, Melbourne on Thursday 9th May 1901. Souvenir spoon in plastic case. There is a coloured picture of the Tatura Fire Station with the wording Tatura Fire Brigade Centenary 1884-1984. Silver plated. Colour photo of Charles Wilson memorial fountain in Tatura in Tatura Bowls garden. Colour photograph of Charles Wilson Memorial. Charles was an early pioneer of Tatura. Born 1855, died 1901 . He was a J.P.
On back of photo, The Charles Wilson memorial fountain situated at the Tatura Bowls club. Folio - Robert L. Kahn. Recollections of a "Dunera Boy". Dark blue plastic A4 folder containing typed material in plastic sleeves. Copy of these recollections given to Lurline Knee, who met Robert at a "Dunera" reunuion, 1991. 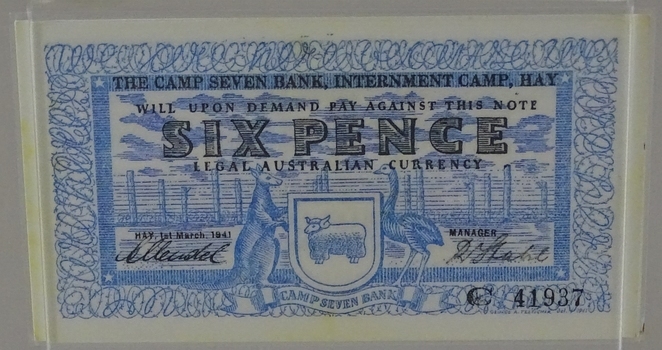 C41937, Printed on back of bank note "This note is valid only within the boundaries of Camp 7 Internment Camp Hay" "The bank is under no obligation to honour this note if presented by holder outside the Camp". Wilson Hall was opened on 10 March 1962. Time clock sponsored by Rosella-Lipton. Boys bikes leaning against wall. Coach, timekeepers sitting behind glass on 2nd level. Rectangular shaped book. Paper, with cardboard cover. Children playing on street at Manzanar. With W.W 2, the Owens Valley California became the first Relocation Centre in1942 to house 110,000 people of Japanese ancestry, two thirds of them American citizens, removed from the west coast. 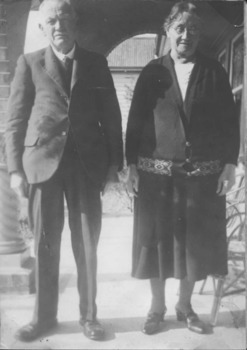 Author Jane Wehrey compiled images from private and museum archives. Medium sized black and white photograph. Eildon Reservoir overall picture / dam wall and construction huts left of middle / dam filled with water right of wall / tree covered hills beyond. Taken by photographer for State Rivers and Water Supply Commission. Photos copied from Superintendent Hannan's album. Presbyterian Boys Training Farm.|Dhurringile Mansion.|5 Photos. Black and white photograph. Several men walking through the gates. All have hats on and they are carrying some luggage. This is a photograph of Italian internees leaving Camp 9. The men appear to be part of a work party setting off for a job. Camp 9 was one of the Loveday Camps. To present various aspects of Vict. development at beginning of Commonwealth. Emphasis on leaders of Gov't and commerce. Various regions included. \made by internees at Camp 3 Tatura. \the material was selected from fire wood. Erich Buloch tuned the recorder to a perfect pitch. Short trousers made of leather with braces attached. Pale green with dark green outline. Very ornamental leather strapping. Fancy buttons. Pattern on braces. Sheath on one side for knife. 2 pockets. Traditional clothing worn by Rudi Kuhnle. Original photograph of H & R Gibbs display window and exterior of Bakers Shop. 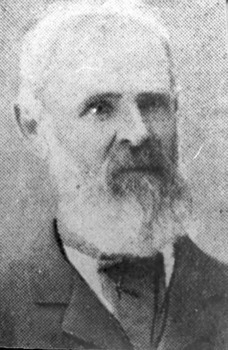 John Gibbs, first baker in Tatura, set up business in 1878. Used to inform tourists at an information centre in South Australia. The case back includes printed description of the content of the DVD. A clear plastic folder with black margin and white paper strip. Black back cover. Made in camp 3 for Mrs Kazenwadel Snr, ex Palestine. This donor was the first contributor to our WW2 camps collection. This photograph was taken for the State Rivers and Water Supply Commission - for display purposes. State Rivers and Water Supply Commission / Goulburn Irrigation System / Enlargement and Remodelling Project / Design and Construction Depot / Enquiries at General Office.